Every Italian town has its charms, yet by virtue of the fact that it became home, Spello has achieved almost mystical importance in my life. I hope this helps you discover the Spello I fell in love with—and perhaps a shade of Spello that's all your own. I'll never forget our first stroll in the groves around our new home. We walked to the top of Spello and spotted a sign directing walkers to the right, along the ancient Roman aqueduct. Not the high-arched wonder I expect when I think "aqueduct," this humble form of water transport resembles a simple stone wall. Only the periodic gaps revealing the inner structure hint at a storied purpose. Olive groves spread out below and stretch above the aqueduct, and the path is bordered by wild fennel and mint. As we walked, my children periodically broke an herb to chew, and the scents drifted around us, mingling with the fragrance born from roots pushing their way through ancient soil. That first walk was warm, and filled with more drama than anticipated as we were rushed by some animal we couldn't identify, but I'm fairly certain was a cinghiale. Okay, perhaps we weren't rushed exactly, but we heard it coming towards us, feet thundering the ground below, and then it arched away. We caught a glimpse of its haunches as it darted between the trees. Cinghiale. I stand by it. Then on the way home, the children make porcupine quill bouquets. Add in the enormous snakeskin and it was a stroll jam-packed with wonder. A few weeks later, we took advantage of a cool morning to try to walk all the way to Collepino, the town tucked back into the valley. 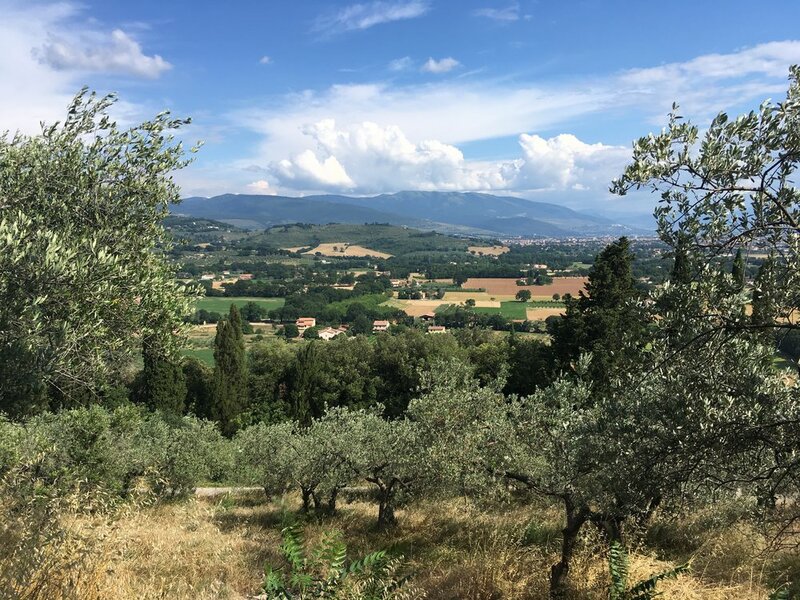 We made a lunch reservation at Collepino's only restaurant, packed cookies and plums and water, and set off, our mind taut with the upcoming adventure of walking to a whole other town. As the path enters the pastoral valley, the Umbrian sprawl fades into a view of rustling trees and sporadic farms. Philosophical quotes on plaques appear at interludes along the aqueduct. We stopped and translated the wisdom of thinkers such as Albert Einstein and Mahatma Gandhi and Oscar Wilde. And Charlie Chaplin. We crossed bridges, passed fruit orchards, plucked wild figs, chewed fennel stems, and admired the olive trees—young trees with light trunks and supple limbs, and geriatric silver trees with dark trunks split with age, glowing in the changing light. Sometimes I wondered if we had lost the aqueduct, but then we would find the chiseled stones and realize that the path had shifted so that the aqueduct lay under our feet. The final stretch to Collepino was punishing—a sheer uphill on loose rocks. As we climbed, my calves convulsing in protest, I began to regret the whole journey. But there was Gabe, leaping up the mountain like a goat, chattering about how steep the path is. We all cheered in victory when the ground leveled into Collepino, a quiet little oasis of a village. 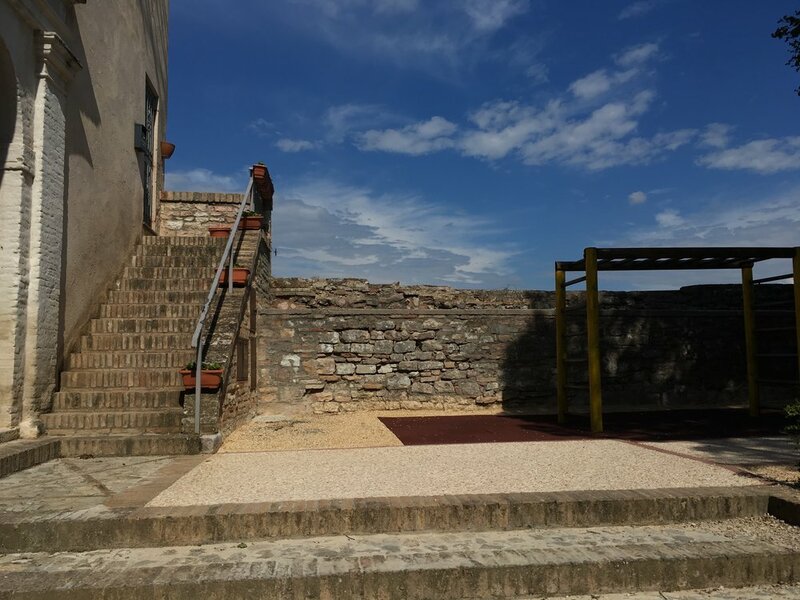 We strolled past the town’s communal ovens, past a winsome piazza with views over the surrounding hills, to a well-earned multi-course lunch. The walk was beautiful and adventurous and yet didn't lend itself to replication. I recently learned that there are multiple routes towards Collepino, and there is one that is far more convenient and less depleting. Ask a local if you are interested. Also consider arranging for a taxi back to Spello. That hill is easier to climb if you know you are almost done walking for the day. When we return to Spello, the aqueduct serves as a pleasant walk, not an adventure to new climes. We walk along it at least once every time we return, and still stop to laugh as we translate the quotes. In the right season, we look for asparagus or greens, and if we can we walk at least a mile (or so) so we can get to the reclining bench. 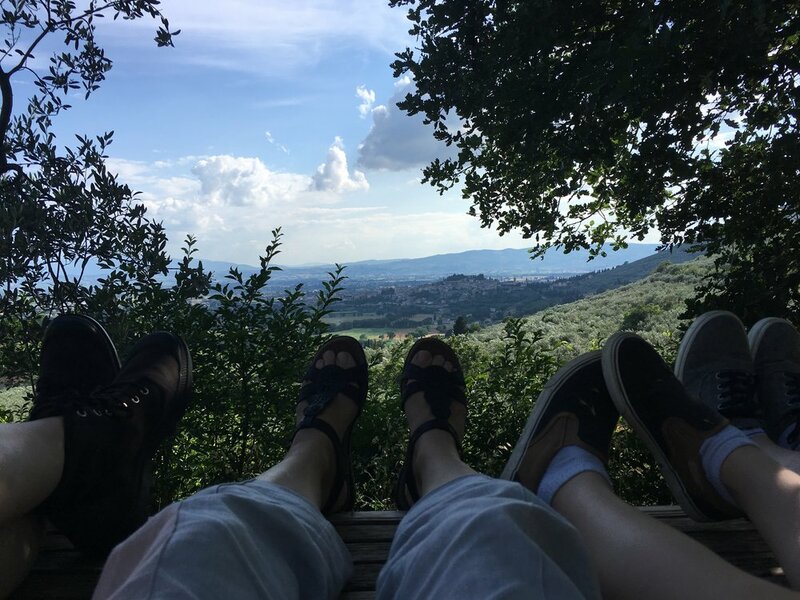 All of us pile on (harder with 2/3 of the kids now taller than me) and sit back, with our toes pointed towards Spello. Since the opening of the Villa dei Mosaici, the aqueduct has an added attraction. Now that we've admired the private bathing chamber for a wealthy ancient Roman family, it's easy to feel the vibrant role that aqueduct once played. I can see signs of it all over town, the places the water was carried from the top of the hill, to the bottom, where the Roman villa stands. This most recent visit, I gave Siena my camera as we walked along the aqueduct and she took all the pictures I've posted here. It was a wondrous thing to see the aqueduct through her eyes. And also to realize that at 16 she has surpassed the camera skills it has taken me years to develop. Ah, well... the aqueduct reminds me that all things shift and pass and change. And that is actually quite beautiful.